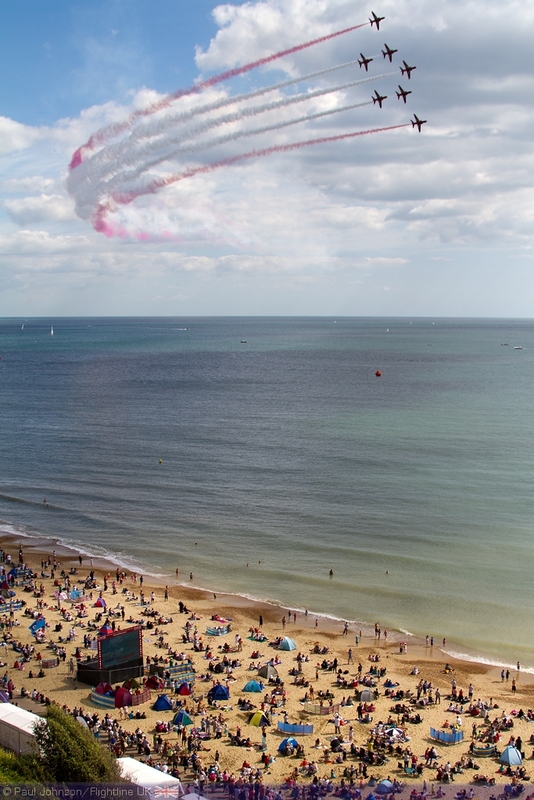 The 2013 Bournemouth Air Festival was launched last night with the promise of another land, sea and air spectacular this summer. Topping the bill, the Red Arrows and Typhoon Eurofighter will be performing three displays each. 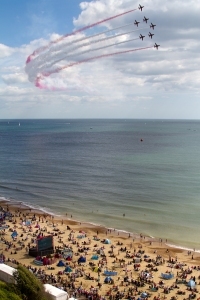 Recognised as one of the top ten air shows in the world by USA Today, the festival has attracted nearly five million visitors since its launch in 2008. The Royal Navy will have a bigger presence than ever before. Among the ships will be the Type-23 frigates HMS Northumberland and HMS Monmouth. In the air will be a Black Cat Lynx and Merlin helicopters, and the Royal Marines will storm the beach from a number of landing craft in their amphibious assault demonstration. This year’s Night Air, the festival’s evening entertainment programme, is set to be the biggest so far. Along with live music from two seafront stages, a third night of dusk air displays is being planned. The night programme will also see the Band of Her Majesty’s Royal Marines Collingwood Beating Retreat on the East Overcliff after an unarmed combat demonstration by the Royal Marines Commando Display Team. Also on show will be the Tutor and Tucano training aircraft, the iconic Battle of Britain Memorial Flight comprising a Hurricane, Spitfire and Lancaster bomber and the Chinook helicopter. Jon Weaver, Air Festival Director, said: “We’re delighted to have the Reds back to full strength and the Typhoon returning for three displays, which is a first for us, is something Festival-goers have been wanting since it last appeared in 2010. Confirmation of the civilian line-up will come later. The festival runs from Thursday August 29 to Sunday September 1.